The majority of visitors come from India & Uganda. Topics: Uganda Safari, Birding Safaris, and Mountain Gorillas. 1,264 users visit the site each day, each viewing 2.30 pages. The programming language environment is PHP/5.2.5. 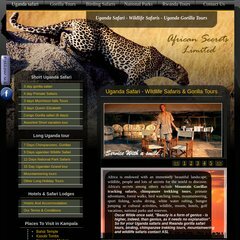 ns.ugandagorillasafaritours.com are its DNS Nameservers. Codero (Kansas, Park) is the location of the Apache/2 server. PING (66.226.72.12) 56(84) bytes of data.